Participating communities on Tuesday, June 12,2018, commenced a-three-day seminar ahead of the second edition of the Sports Ministry’s inter-community football championship. The workshop, which was organised to help communities ahead of the league system tournament, also engaged participants in idea sharing. Deputy Minister of Sports, Kai Lawrence Mbayo, said the move was a right step to revive sports in the country. 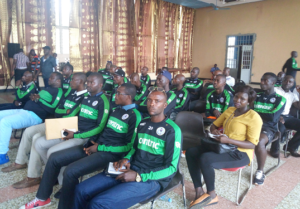 According to the Director of Sports, the upcoming inter-community football championship would be a rebirth of football in the country, adding that the tournament will help involve communities in the game. Later in the open day program, participants were taken through several topics like sports and society and the purpose of charity shield tournament. Also, former Leone Stars duo, Atto Mensah and Abu Bakarr Toastao Kamara, Chef de Mission, Unisa Deen Kargbo, the Sports Writers Association of Sierra Leone, Sahr Morris Jr. and George Wyndham all gave motivational talk towards to the game and the need for communities to embrace the tournament. The workshop continues on Wednesday with Women disability and sports, media marketing and anti-doping all topics to cover.